With crime declining in the Netherlands, the country is looking at new ways to fill its prisons. The government has let Belgium and Norway put prisoners in empty cells and now, amid the huge flow of migrants into Europe, several Dutch prisons have been temporarily pressed into service as asylum-seeker centers. 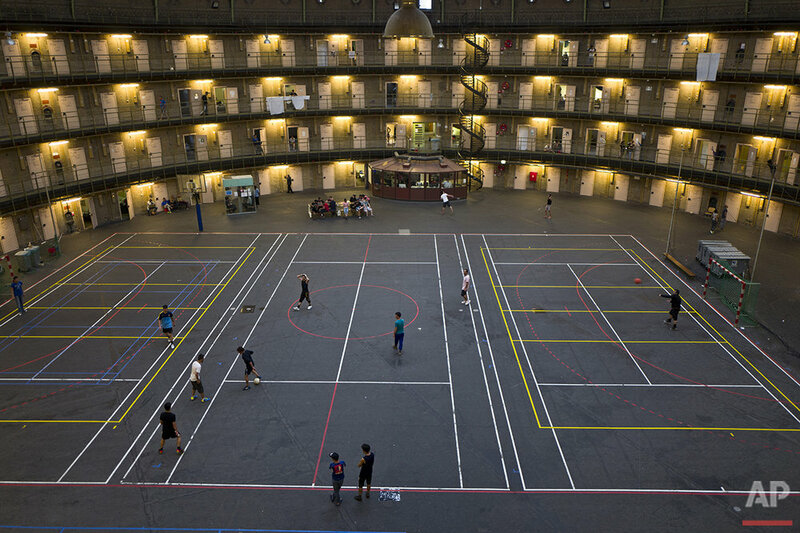 Most of the 12 former prisons and jails housing asylum seekers have been so transformed that they are barely recognizable as former places of involuntary detention, though in some cases the thick cell doors and bars on windows are stark reminders of the past. In this video, AP photographer Muhammed Muheisen describes covering migrants living in a defunct prison in the Netherlands. Prisons in the cities of Haarlem and Arnhem, with their distinctive domed roofs and circular galleries of cells around a central covered courtyard, are considered national monuments and cannot be renovated. Even so, with just under 60,000 migrants arriving in the Netherlands last year, they have been temporarily pressed into service to house hundreds of asylum seekers. "We had to think twice about using prisons with (cell) doors," said Janet Helder, a board member with the Dutch government agency responsible for housing asylum seekers. "Some people in the neighborhood asked, 'how can you put people from Syria who may have been imprisoned there in a cell here?' So we decided that if people really have a problem with it we will find somewhere else for them." But the prisons often are well suited to their new use, Helder added. Her organization currently is housing some 41,000 people at 120 locations throughout the Netherlands. "The rooms are intended for one or two people, there are often gyms, a good kitchen," she said. "So in that sense they tick many of the boxes we are looking at." Asylum seekers who spoke to The Associated Press during recent visits to the prisons had few complaints beyond gripes about the food. While they live in prisons, they are free to leave the buildings and grounds during the day and even spend some nights away. Abdul Moeen Alhaji, a 16-year-old Syrian, is happy to call a prison cell in Arnhem home after initially staying in a tent in a temporary camp outside the city of Nijmegen. "I don't feel that it is a prison," he said. "What matters is that we are safe here"
Menno Schot, who runs the center in the Haarlem prison, says staffers try to help the 400 migrants adapt to Dutch life as they wait for the lengthy asylum process to start. For 18-year-old Gerbia Hajji, a Yazidi from Sinjar, Iraq, that has meant practicing riding one of the Netherlands' ubiquitous bicycles in a courtyard at the Haarlem prison. Her husband, Yassir, was a barber back home and wants to learn Dutch so that he can pick up his trade again. He was keeping his skills up to date recently by shaping his wife's eyebrows in the cell they share on the third floor of the Haarlem prison. In a nearby cell, a single flower taped to its door, Hamed Karmi was also practicing — playing a keyboard while his wife, Farishta Morahami, sat on the bunk bed in their cell listening to the music, a calming way to spend a few minutes for the young couple who fled a village near the Afghan capital, Kabul, amid rising Taliban attacks. They paid smugglers $8,000 to get to Europe. "Their safety is our main priority along with their health and daily needs," Schot said of the prison's new residents. "The country is new for them so we are their guide in Holland." 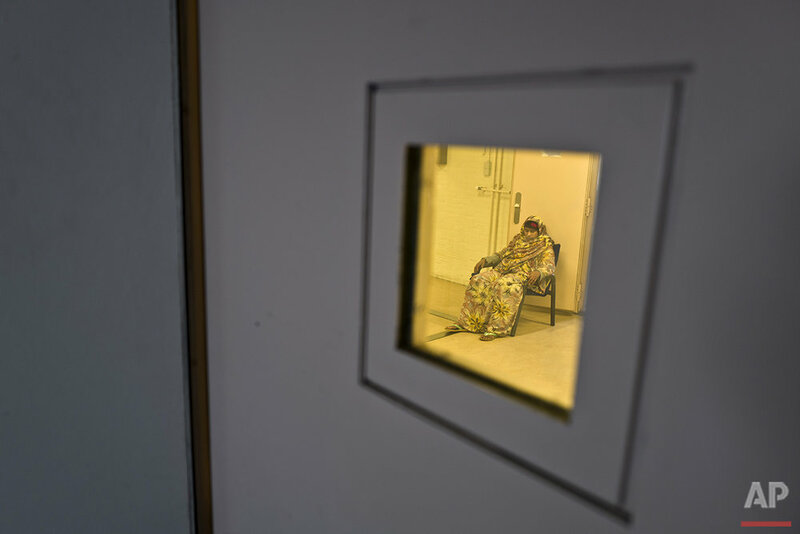 Text from the AP news story, AP PHOTOS: For asylum seekers, Dutch prisons feel like home, by Muhammed Muheisen. See these photos on APImages.